I've been busy the past few days and had kept my nails polish free for about 2 days, that is because I had to do our laundry. Our two helpers got sick and had to go home for the meantime. I was so worried also because I'll be reporting back to work tomorrow and nobody will look after our son, while hubby and I are at work. We're so thankful that God had answered our prayers, because our former helper had agreed to stay with us until my son's Yaya's return. 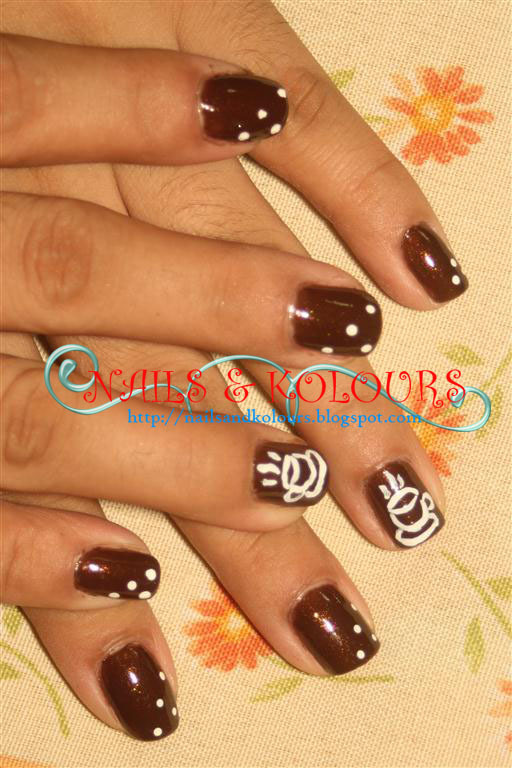 That is why I thought of having cups of steaming dark chocolate on my nails as my nail design for today, inspired by a Filipina Nail Artist, Rina. The timing is so perfect because it is raining outside, and I definitely need a hot drink. I doodled the design first on a piece of paper and did some practice until I was able to draw the cup nicely. Then off I goes to my two ring fingernails. Two fingers will do because it took me several trials and errors before I got it right. It would be a torture if I had to draw this cup on all nails. So, what do you think? Did I get it right? I hope you like it. I had to ready my things for tomorrow's first day of work after 60 days leave. ciao! 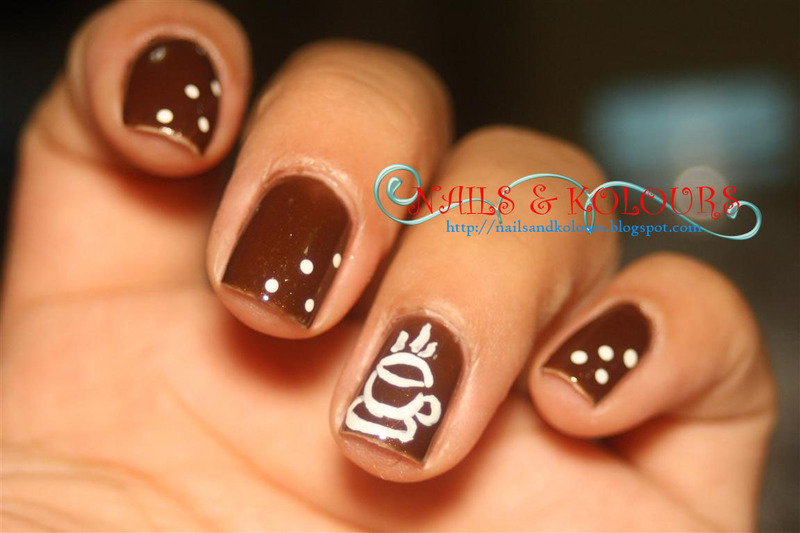 your nails looks so yummy...as if i'm drinking hot chocolate, haha! gorgeous! May I just say that the color is yummy...coming from someone who simply loves coffee. :-) And that cup doodle is so awesome! 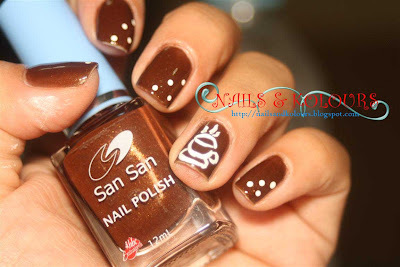 Now I'm tempted to ask you to do my nails hahaha! But you'll have quite a challenge as I have very small nails. funky! you are very creative. Love the coffee there! Nice touch! You are so creative in nail art. ang galing naman ng drawing mo sa cup! :P hehe very artistic! Amazing! How did you do that design? You're artistically good! Great design! 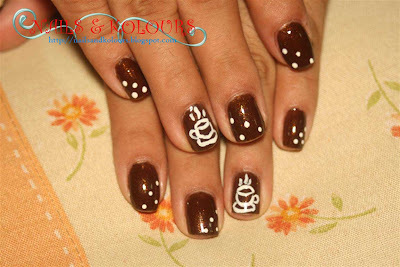 It was just right to have painted the cups on two nails only. I don't think it would have turned out as beautiful had you painted cups on all your nails. Nice design indeed. You are such a great nail artist.